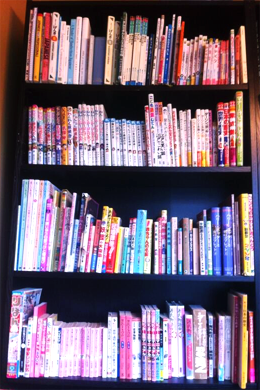 One thing I worry about, as the tadoku contest becomes more popular, is that beginners will take a look at who’s participating and what many of the top scorers are reading, and conclude that tadoku is for people who are reading at a high level already. I think the format implicitly supports this, even though it’s just trying to make things fair, because if you say that a screen of game text or a page of manga is worth so many fractions of a book page, then it follows that a worthy book page is a book page with a lot of text on it. So if you read books with pictures and not a lot of text per page, it might even feel like you’re not being fair to people who are reading more difficult stuff. Ideally, I think a tadoku contest based on word count, not pages, would be the most accurate and inclusive (and BlackDragonHunt would still whip us all!) but using pages makes a lot of sense because they’re so easy to keep track of. But please, if you want to try tadoku and participate in the fun, don’t hold back because you think the books you could read aren’t impressive enough, and don’t push yourself to read a book you can’t read fluently. I’m reminded of the parable of the widow’s mite, where the tiny amount of money the poor woman donated was worth more in God’s eyes than the huge amounts of money offered by rich men, because for her it was a true sacrifice. Someone who’s already read a lot is used to a lot of sentence patterns, can read hiragana and a lot of kanji automatically, commands a decent amount of vocabulary and should be good at figuring out the meanings of unknown words without even consciously thinking about it. So readers like me are coasting along on our metaphorical riches, while the beginning reader is just starting to jingle a few coins together. But the reading that beginners are doing is proportionally as challenging for them as a more advanced book is for an intermediate learner, and it deserves respect. So even if you’re just reading ぐりとぐら*, as long as you feel like you’re getting something out of it, you’re challenging yourself and, most importantly, you’re enjoying it, then I believe that you’re doing wonderfully and you ought to be proud of yourself. We all learn to read by reading, so whatever level you’re at, getting used to reading fluently can only be a benefit for you. The contest aspect of the tadoku challenge is fun and all, but in the end we’re all in it not to prove something to each other, but to improve ourselves. Don’t wait until you’ve finished learning every kanji. Don’t spend an hour trying to piece together one page of one book. Don’t be embarrassed to practice by reading easy books. Just get on Twitter, type @TadokuBot #reg, then find something fun on Ehon Navi. Let’s start 2014 off right with some reading! I really think everyone ought to read this one, because who doesn’t love stories about aliens making funny noises? But at 45 words, it’s suited for beginners. This surreal story of a shape-changing ninja is a step or two more difficult at 200 words. This whole dang book is an excuse to set up an atrocious pun. * ぐりとぐら (Guri and Gura) is the story of two little mice who do some cooking. It’s a picture book that’s probably as familiar to most Japanese people as “Goodnight Moon” is to Americans. This book is part of a popular series of books that are divided by grade level. There’s short stories, biographies, science facts, stories about animals and so on. (A lot of them are listed on the page I made for short story collections divided by grade level.) This particular book isn’t recommended for any particular grade, although I personally would peg it at about 3rd grade level. It’s divided into 37 short essays that answer questions such as “What does the Prime Minister do?,” “What are stocks?” and “Why do we study English?” It also has a short story at the end of each chapter. It’s also nice because its content dovetails with that of one of the best sites for intermediate readers, NHK News Web Easy, which puts up five articles every weekday from NHK News that have been rewritten in simpler language. Many of the words that are explained in this book frequently appear in several news stories, such as 世界遺産 (World Heritage) and 遺伝子組み換え (genetically modified). I think that the writing is slightly more complex than the average News Web Easy story, but if you’re in the habit of reading them, or want to be, this is an excellent supplement. According to Hitosugi and Day’s classification system, I’d give it a 5. There’s a good deal of text, but it’s not too small, and there are just enough pictures to help the reader understand what’s going on. All kanji have furigana, and I think that for a 3rd-grade level book it’s pretty heavy on the kanji, which is nice for those of us who like a lot of kanji in our reading material. Happily, there is a preview of this book up on Google Books. I don’t think any of the essays are entirely available, but there is enough content that you should be able to tell if it’s a good fit for you. It’s at Kinokuniya, YesAsia, and of course there’s always Amazon (watch the shipping and handling fees) and honto as well. I paid $15.60 for it at Kinokuniya, which was a bit expensive, but I think it was worth it. You can see if it’s at a library close to you with worldcat. Weekly update number, uh, where the heck did I leave off? I have no idea how to number the weekly updates anymore, since I’ve hardly done them every week! So, to heck with it, really :) I’ve kind of lost track of how many books I’ve read and how many words I’ve read, too… I guess that it’s a sign that I don’t need to track them anymore, once the number doesn’t matter to me! I’ve been continuing to read the NHK News Web Easy articles over breakfast. I love them, I wish there were more than 5 a day! I’ve been watching a lot of the NHK school programs, too. (I’ll put them on when I’m feeding the boy, for example. Makes the shoveling of oatmeal a little less boring.) Are you watching 歴史にドキリ? You should at least check out the songs. I mean, who doesn’t love watching Commodore Perry bopping around with members of the shogunate? All right, that’s enough self-indulgent chatter for now. And for you, that’s enough reading of the self-indulgent chatter! I know, for me, it’s way too easy to get into reading about Japanese without actually reading Japanese. If you’re a beginning reader, go, right now, and read なめれおん, the little chameleon that licks everything. It won’t take you long and it’ll brighten up your day. If you’re an intermediate reader, give おばけにょうぼう a try. It is beautiful and creepy and it’ll teach you what 仲人口 means. I started translating for Cookpad at the beginning of this month! Cookpad is the largest Japanese recipe site, and they just started an English version. In practice, I proofread and edit other people’s translated recipes more than I translate myself, both because I think that I do a good job with that, and because I’m a slow translator. (Well, it’s not so much that; it’s more that I get caught up on maybe one or two things that confuse me or get distracted by something interesting in the recipe. Since I’m paid by the recipe, these side trips are costly.) So that, of course, has affected my tadoku time, but it’s also made me excited about improving my Japanese. 1) I read the new articles on NHK’s News Web Easy every weekday morning while I had breakfast. I had started doing this shortly before tadoku started up, actually. I’m at the point where they’re well within my fluent reading level, and they’ve been awesome for reinforcing vocabulary I only encounter a little bit in books. I’d like to branch out, but the other news sites for kids I’ve seen seem more like regular news with furigana added, and I’m not quite there yet. 2) I watched a lot of drama. I use an app called J-Drama Master to download Japanese drama to my iPad, and then I watch it while I’m at the gym. Not all of the offerings have subtitles, but plenty of them do. I’m pretty lousy at understanding spoken Japanese without subtitles, but during Tadoku time I can pretend it’s reading practice! I ended up watching a lot of different shows, but I’m particularly taken with ごちそうさん. 3) I took a tentative step into the world of manga. I’m actually kind of intimidated by manga, because there’s so many to choose from that I don’t know which I’d actually like (I’m pretty picky), the ones I do want to read are still too hard, I have a hard time figuring out who’s talking sometimes, I can’t deal with the teeny tiny handwritten notes and all the sound effects, and I often feel like I’m missing something, like when sentences are left unfinished, people are being vague and so on. Ciao, a manga magazine for young girls, has the first chapter of its stories available on its webpage, so I did a sort of… manga boot camp? My findings are that the ultimate Ciao manga setup involves dogs, a heroine with a cute name, handsome boys, super-elite schools and transfer students. Mix those five things together and you’ve got a hit! Anyways, I read 29 of the first chapters available on the Ciao homepage. I can’t say I liked any particular one of them enough to actually go buy the collected books, but I enjoyed the feel of reading a phonebook manga, if that makes any sense. It’s annoying reading them on the computer, though, the characters are too small and I can’t read the furigana half the time. 4) I read a bunch of books. I actually have a big backlog of books from when I was studying and ordering books, before I got pregnant, so I read through a fair amount of those. I’m amazed at how some books that were pretty hard for me when I started tadoku have become much easier to read. I haven’t been the most diligent learner — now that’s an understatement, considering I completely abandoned Japanese studying when I got pregnant — and I sure haven’t done much to study besides read. 5) I played one game, a GBA game called “Sparkling Nurse Story” ピカピカナース物語 which was kind of like a simulation game, where you take care of patients, do mini-games and make choices in how you interact with people. I got the worst ending because I wasn’t able to raise one stat, and when I went online to look for a walkthrough or something, the first hit was a blog post basically saying “It’s impossible to raise that stat!” After some digging, I found a post saying that you have to force the minigames to appear more often by getting the patients almost well, then leaving and coming back another day. I didn’t have the patience to try again, but hey, maybe someone else will play this sometime! 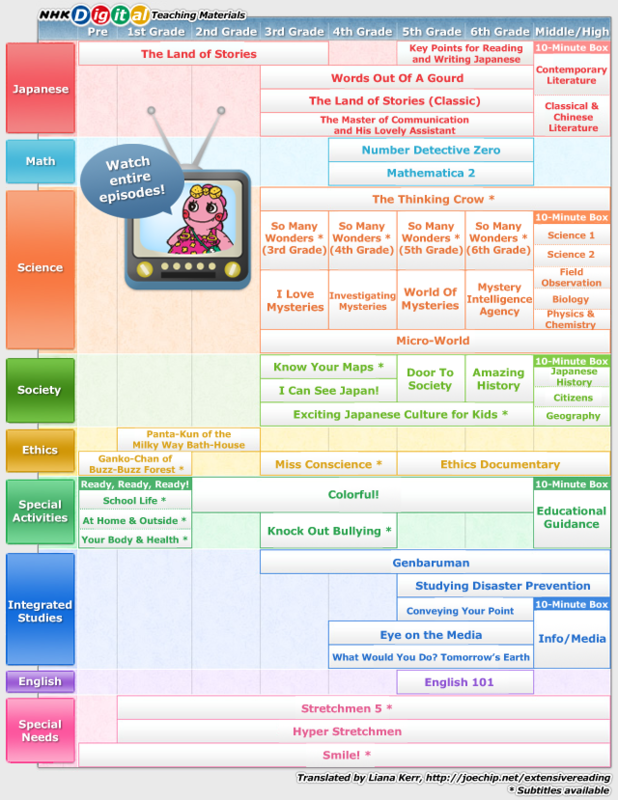 NHK, Japan’s national public broadcasting organization, has more than fifty free educational TV programs available through their “NHK for School” site. Each program also has a summary available for it, and many have extra clips or supplementary materials as well. This is an amazing resource for language learners, and I decided to translate the main menu so that Japanese learners can more easily find programs they’re interested in for whatever level they’re comfortable with! The main program pages all follow about the same format, so they’re easy to navigate. You can switch episodes by looking at the very top of the page for the words 2013年度 and ほうそう回. Clicking the first will allow you to select different years (if available), and the second will allow you to select a different episode. There’s a little intro graphic underneath the top menu with links to things like what the program is about, who the characters are and so on. The video and the outline are available under the heading ばんぐみ. Clicking on the image, or the word どうが, will take you to the video, while あらすじ is the outline. To the right of the video are clips, supplementary materials and materials for teachers. With more than 50 programs, even I haven’t watched an episode from each one, but so far I really like the “So Many Wonders” series (ふしぎがいっぱい), “Amazing History” (歴史にドキリ), “Smile” (スマイル), “I Can See Japan” (見えるぞ！ニッポン) and “The Master of Communication and His Lovely Assistant” (お伝と伝じろう; probably the translation I took the most liberty with!) If you find any you particularly like, write a comment about it! Thanks to my friend Tsubasa for help with some of the title translations, and to Image Maps for the imagemap function! I suppose it’s a little too similar to my previous post, but registration for the 2013 Tadoku Contest round 4 is open! Milo is gradually switching to taking one nap a day, instead of two naps a day, but I should still have time to get some reading in. EhonNavi now has over 1,000 Japanese picture books available for free! If you are new to tadoku, whatever your ability level is, it’s probably one of the best ways to start. I find that word count is, with a few exceptions, the best way to judge a book’s difficulty level, and so I’ve been reading through them and sorting them by estimated word count. So if you’re a beginning learner, pick out a book from the list! If it turns out to be too hard, find one with fewer words, and if it’s too easy, find one with more words. If you’re advanced enough not to need this kind of guidance, Ehon Navi split the available books by age and that’s probably the best way to find ones within your level. Either way, don’t forget Sakai-sensei’s tadoku guidelines: don’t look up words while reading, skip parts you don’t understand, and if you’re not enjoying the book, get another one. To access all these free books, you’ll have to register. For help with this, please see my registration walkthrough. And don’t forget that the site is finicky; they want you to be using Windows and Firefox and it might not work otherwise, you have 15 minutes to load the story, and you can only read a story once. For more information on how to successfully use the page, please refer to the EhonNavi entry in my list of reading material. Tadoku contest 2013 round 2! The Tadoku contest 2013 round 2 has started! All month long, we’ll be reading and reporting the total pages read on Twitter, thanks to TadokuBot. Last week, Milo started taking naps without me having to rock him for hours, which means every day I have an extra bit of time for myself! So I’m totally in this month. I’m starting with なぜ？どうして？社会のお話. The first chapter is all about money, so I’ve been reading about how ATMs work, how shares in a company work and so on. Happy reading, everyone! I always look forwards to everyone’s summaries of what they read and how they feel about it, even when I wasn’t participating myself. I’m pleased to say I read one whole book for the tadoku contest! Difficulty: Very, very active and demanding little 11-month old. I finished the book over two glorious reading sessions; during the first, my husband Brian took him to the store and to the park, and during the second he was at Grandma’s house. I can do things with a baby around, to some extent (as I write this, he’s sitting on the ground alternately trying to flip through a book and pushing it around) but as I’ve said before, there’s no such thing as flow with him around. The book I read was called おばあさんのお手玉, about a girl and her grandmother. Her grandmother liked to make beanbags and give them to local preschools and was also an excellent juggler. She had some special beanbags that she’d bring out on her mother’s birthday, and most of the book is her story of her childhood during World War II and why those beanbags were so precious to her. Something like a hundred pages and 6000 words, so a pretty decently sized book for me. Lately I have little free time and a whole lot I want to do with it, so thanks to LordSilent and the tadoku contest for the push I needed to read a bit! I added more picture book word totals to my Ehon Navi page. One problem with it is that it’s probably not very clear how useful it is; word count generally corresponds to difficulty (not always, but close enough) so it’s the most useful way of figuring out whether or not a book is at your difficulty level. Two of my favorites from this session were from the same author, Fujio Tsuchiya. Can’t Wait Three Minutes and Kidasaurus, good times. I also dig that Lickelon, since my baby is at that stage where everything goes in his mouth, so there are certain similarities there… Anyways, I’m up to 380,500 words, for a total of 303 books. I’ve been enjoying reading in Japanese again! I’ve got some good work done on the Ehon Navi project, and I’ve been re-reading some of the books from my collection. I’m up to 376,825 words, though my notes got a little muddled while I was distracted with the boy for all those months. Ehon Navi has been driving me up the wall. Whether I’m using Firefox on the Mac, Firefox on a PC (well, on VMware Fusion) or Internet Explorer on a PC, it doesn’t consistently load. When it seems like it’s hung up for good, sometimes I can get away with closing the browser and re-opening it. Sometimes it doesn’t load, ever. Sometimes it loads just fine the first time. The upside is that if I can get a book to load, as long as I keep that window open I can go back to it whenever I want. (Important with a little guy that needs my attention all the time!) All the same, I’m glad it’s available, and I hope it’ll be of use to other learners, too. I haven’t read Japanese picture books for a long time, and it’s really rather relaxing when my brainpower is feeling low. Some of them are so darn funny or weird I have to summarize them for my husband. (Looking at you, Monster in the Moonlight.) A lot of so-so ones, but oh well. Oh, and I finally bought 着物のえほん (A Picture Book of Kimono), which is just gorgeous and full of kimono knowledge. I’ve wanted it for a very long time, and since I was ordering another book from Kinokuniya to replace one I lost anyways, I thought I’d just go ahead and get it! Kinokuniya’s online ordering doesn’t seem to be ridiculously complicated anymore, incidentally. I’ll have to update my posts that mention it.